Now that we got the spiralized mac and cheese down, it’s time for another classic: Spaghetti Carbonara. And since for the mac and cheese, I gave y’all two options (a butternut squash and a sweet potato), I decided to give you two carbonaras: one zucchini, one sweet potato. And again, I cannot believe it took me this long to recreate a carbonara: it’s so dang good. That’s a shout out to my friend Shannon, who loves to use the word “dang” when she’s excited about something. So, dang. Especially now that it’s wintertime, it’s pasta and soup time. 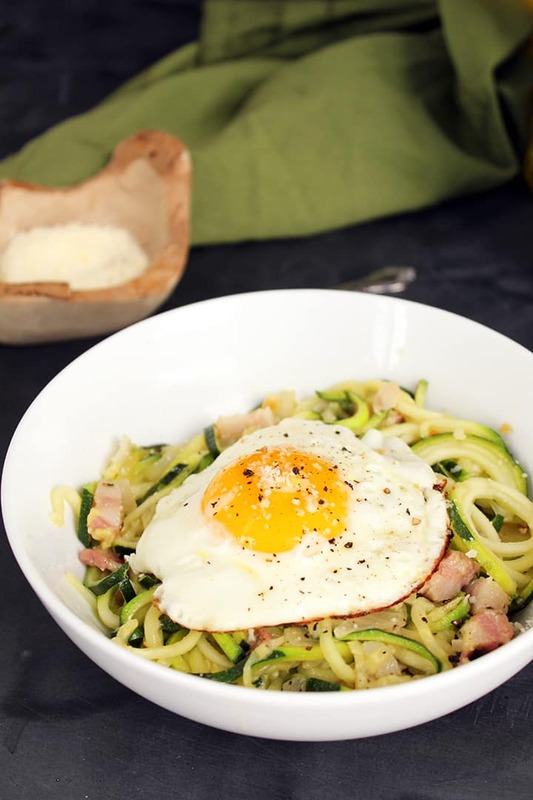 You may want to warm some crusty whole grain bread in the oven while you’re making the zucchini version, because you’ll want to sop up the flavors of the egg yolk that infuses with the cooked pancetta. Also, I’m re-obsessed with cubed pancetta. It’s like a thicker, lovelier version of bacon. Speaking of thicker bacon, if you are ever looking for a steakhouse in NYC, go to American Cut in TriBeCa and order the Bacon, Schaller & Weber appetizer. Trust me. Just, trust me. Without further ado, here are the recipes. If you’re a vegetarian, swap in some veggie bacon bits to get that smoky flavor. 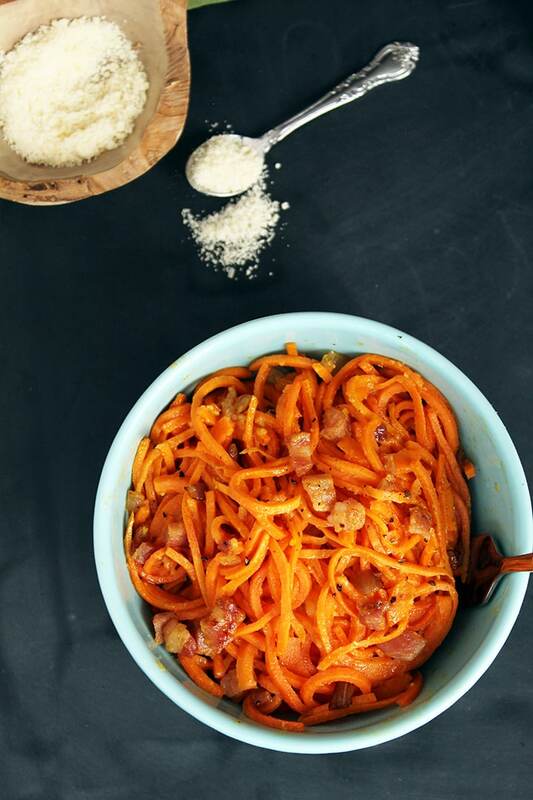 While the sweet potato noodles cook, you cook the pancetta, garlic and onions. 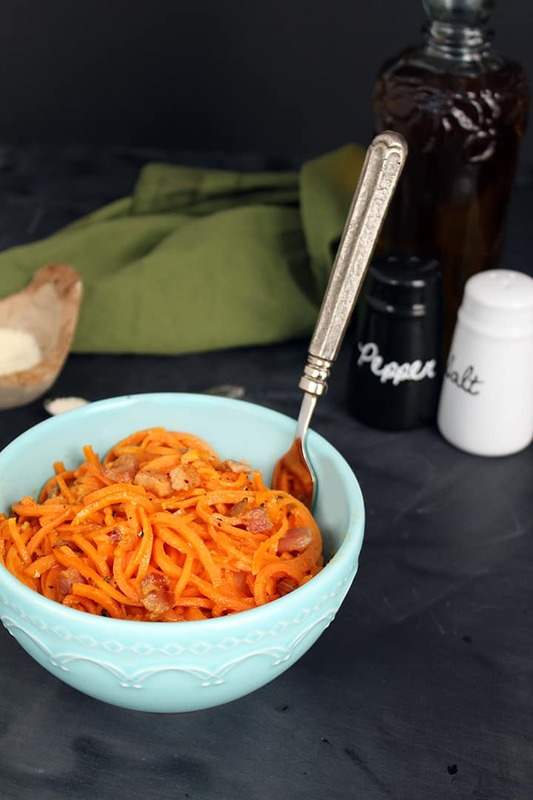 Then, you add those sweetened sweet potato noodles into the salty and garlicky pancetta to make an absolutely amazing flavor combination. To top it all off, this first recipe uses a classic carbonara sauce. It’s butter-free and creamless of course, but the sauce is prepared in the traditional way: beaten eggs and parmesan cheese whisked together and slowly poured over warm pasta to cook slowly and create that eggy-cheesy comforting flavor. Every bite here is an adventure. Whether you’re getting a spoonful with the creamy sauce or one with more pancetta, you’re delighted. 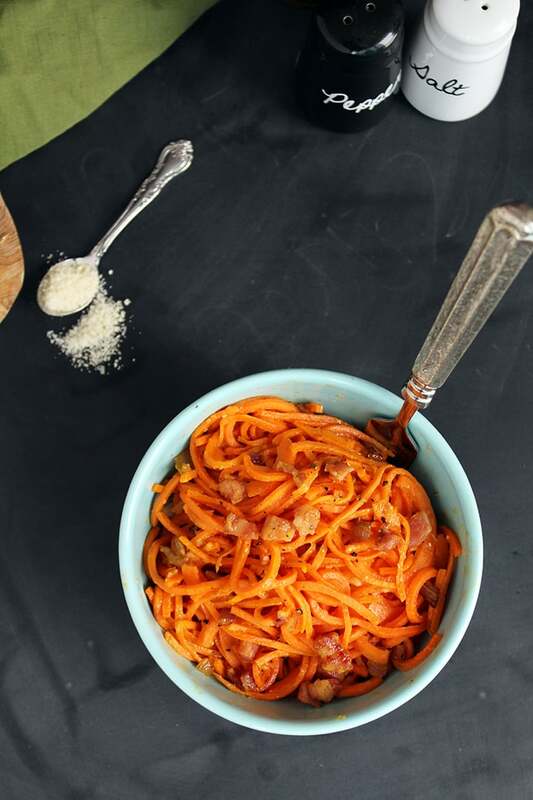 The sweet potato noodles create the perfect sweet and savory balance. The meal is so satisfying and different, that you’ll want to make a big vat of it, like they do on Diners, Drive-Ins and Dives. If you’re not afraid to get a little creamy, this is the recipe for you. 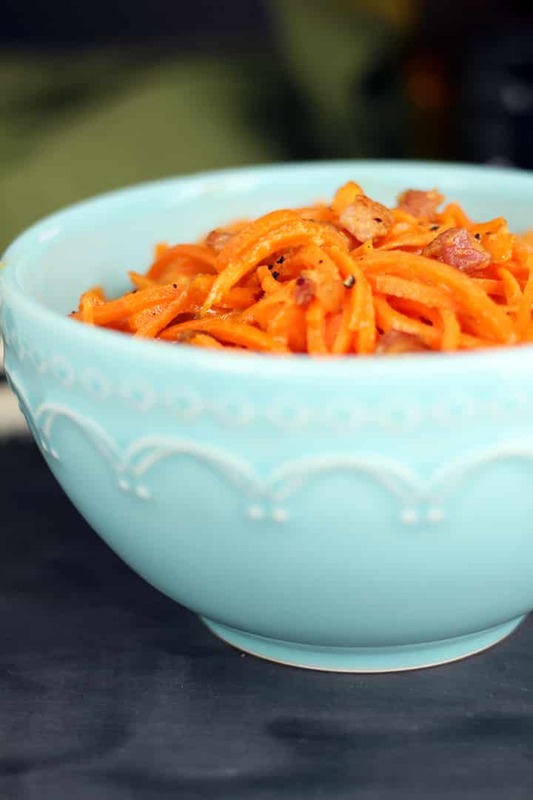 Plus, you’re ditching those refined pasta noodles for fresh sweet potato ones. So, it’s okay to indulge – it’s worth every bite. 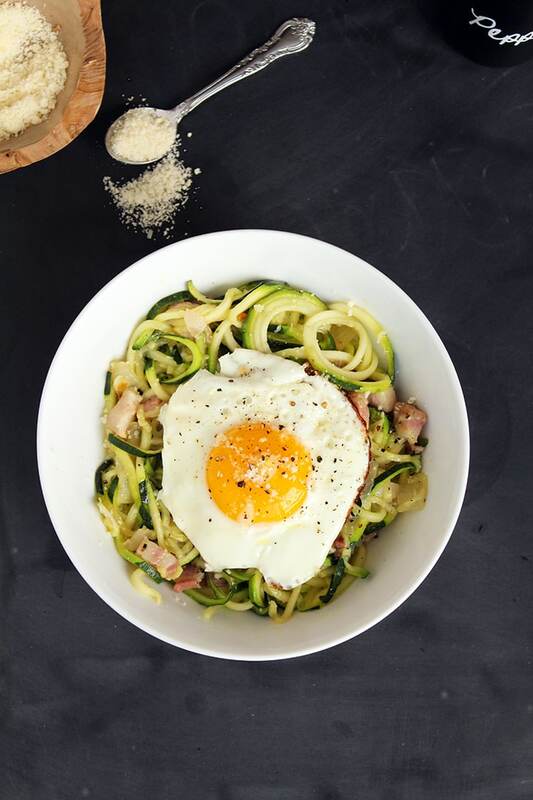 When your fork first pierces the egg and the warm yolk spills out over the zucchini noodles, your heart will swoon. 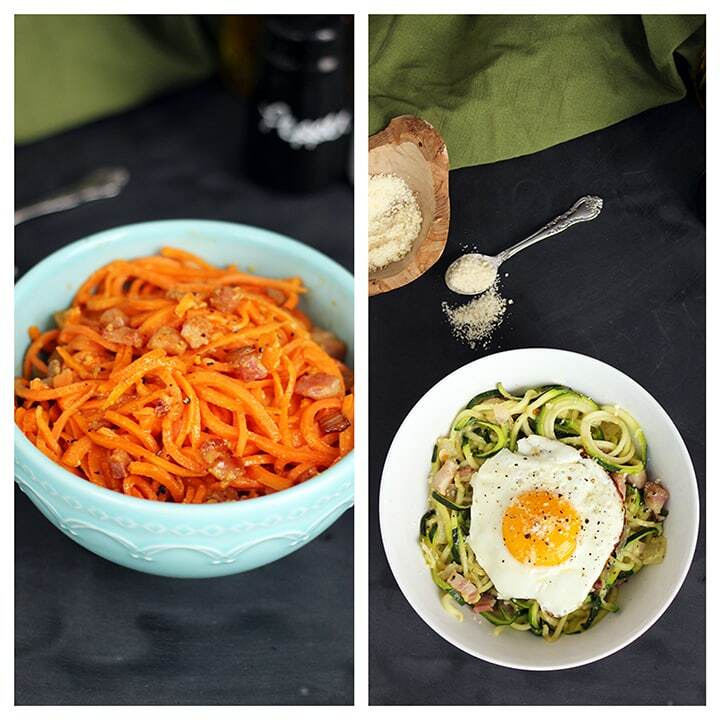 This “healthy” version of a spaghetti carbonara is to-die-for. I’ve seen this trick (the fried egg as opposed to the carbonara sauce) in many trendy restaurants and I love it, because you can’t beat that fried egg runny yolk-ness. Nothing compares. 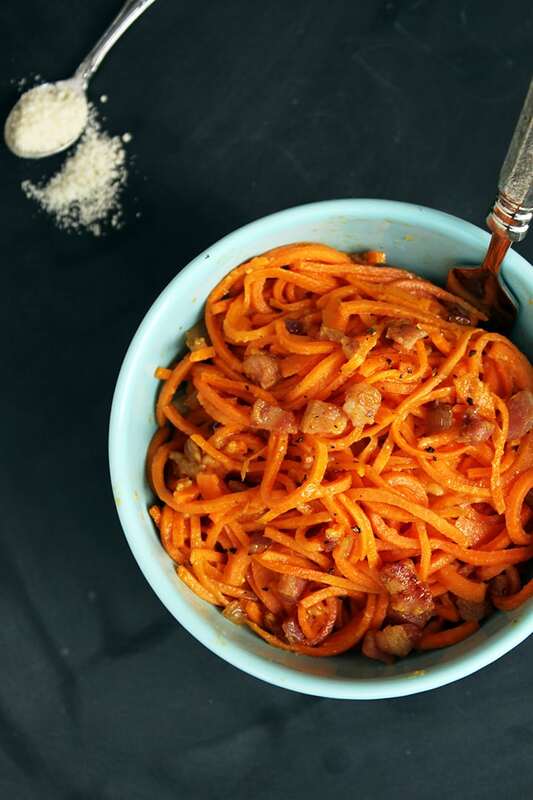 Plus, this is a lower-calorie, low-carb version of the sweet potato carbonara. If you’re trying to watch your waistline but want to indulge, this is the recipe for you. Guess what? This is under 350 calories! This version of carbonara will become a quick and easy go-to dinner dish. I promise! Place a large skillet over medium heat and add in the olive oil. Once the oil heats, add in the garlic and red pepper flakes. Cook the garlic for 30 seconds, add in the onion and cook for 2-3 minutes or until the onion softens. Then, add in the pancetta cubes. Cook, stirring often, until cooked through, about 5 minutes. Once the pancetta is done cooking, add a medium skillet over medium heat and crack over two eggs. Let them cook until the egg whites set. 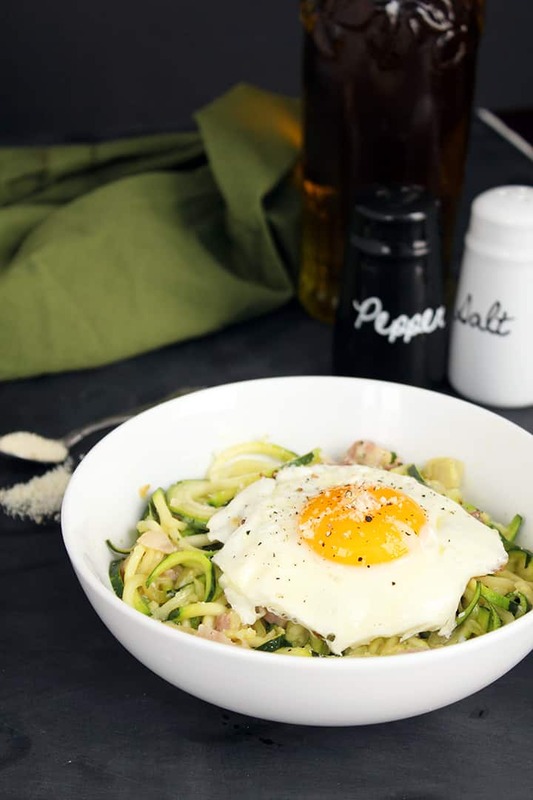 While your eggs are cooking, add the zucchini noodles to the pancetta, season with pepper and toss to combine. Stirring frequently, let cook for about 2-3 minutes and then add in the parmesan cheese. Toss the noodles with the cheese and then plate into bowls. Top each bowl with one of the eggs. Enjoy! What do you think? Which recipe is your favorite? 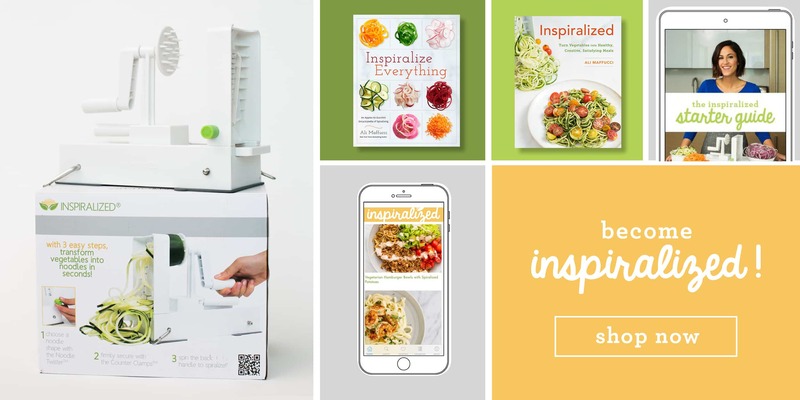 Ali, I love, love, love your recipes! Cannot wait to try both of these next wk! Thank you and please keep those delicious recipes coming! Thanks for the kind note, Lynn! I'm so glad you're liking the recipes. "Dang" is ok. "Ding-dang" is excellent. These recipes look ding-dang good! Just made the zucchini version! Delicious. Your recipes are the best. Thank you for sharing your amazing creations. I'm officially obsessed. Thank you so much - I'm glad you liked the recipe, Mandy! Ooo! Two in one post! Love it. I'm definitely inclined to think that the sweet potato idea is FABULOUS (because, SWEET POTATO) but something about the zucchini is also really attractive! Thanks :) They both rock! Healthy Carbonara?! Umm,...yes please! I have an obsession with zucchini noodles, so this needs to happen to my face! Looks Delish!! But I thought it was no dairy on paleo...... Your recipe states to use grated cheese??? Just wanted to say that I made the sweet potato one and it was delish! I subbed nutritional yeast for the cheese, to make it paleo, and it was fabulous :) Even my hubby who can detect the yeast fell in love. I also added some shredded chicken since I didn't quite have enough bacon. Can't wait to try the zucchini one, too! I love this recipe and I'm so glad you did too! The zucchini version is great! Wow! The Sweet potato version was excellent. I cooked it all in one skillet, browned the pancetta mixture, took it out, cooked the sweet potato and when it was almost done mixed the pancetta back in. One skillet is enough for me to wash! Great recipe. Can't wait to try the zucchini!!! Thanks for taking a stab at it, Nance! Glad you liked it! made the Zucchini carbonara tonight. Delicious! I didn't have cubed pancetta but subbed Bacon. Thank you for this recipe! I'm sure it's just as yummy with bacon! Thanks! Thanks for all the recipes! This was amazing! I poached the egg instead, as I'm not a fan of crispy egg white. But you're right, when that yolk broke open and smothered my zucchini, it was heaven. 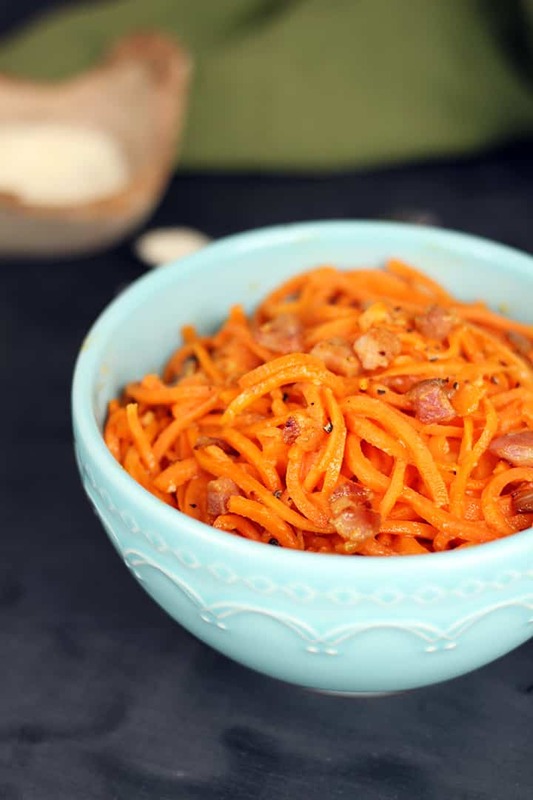 Can you make the sweet potato version with zoodles instead? It's really beautiful how can I found it I live in Saudi Arabia but I can't found it any mall or supermarket how can I buy it?? Thanks for the recipe! Just wondering if you have any tips for reducing the water content when using zucchini.... I always end up with a pool of water in my bowl even though I salt and strain the raw zucchini before cooking. Yes, I have a full video and post about this - check out my How To page! 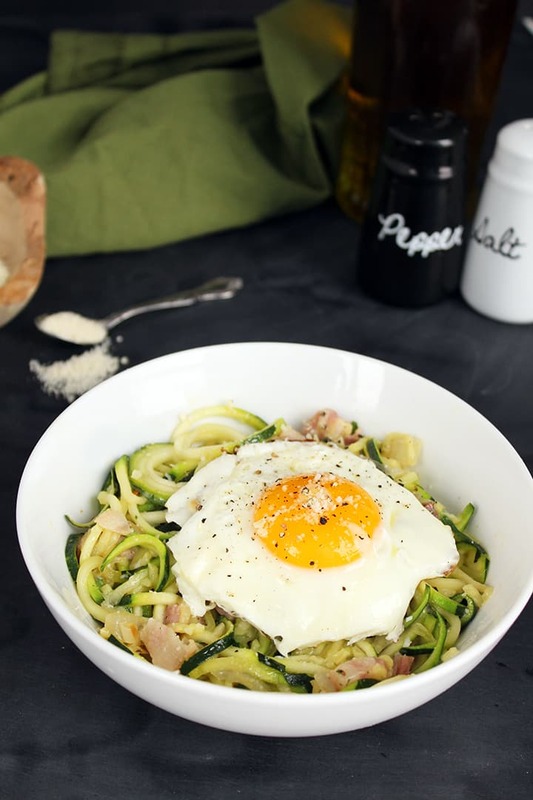 Ali, I made Healthy Zucchini Noodle Carbonara tonight and I absolutely LOVE it! I cannot wait to make it again! I am so looking forward to receiving your cookbook! I was finally able to make this recipe. I did change a few things. I used one zucchini and one parsnip, well, because, have parsnip must spiralize! It was great!! I left out the meat and reduced to cheese to a very light grating on top of the egg. I love the flexibility of this recipe!! Will definitely be making it again!! I was thinking that carrots instead of sweet potatoes would be very good. Also, for those who don't do bacon, you coconut bacon recipe would be delicious. Jeg er snublet! – Status på 2016 – blog – Ik flere undskyldninger! Thank you for this recipe!! Made it tonight and my sweet potato hating friend even loved it!! So yummy! Ali, going to try this tonight with a sautéed breadth of chicken! Plus I have been spiralizing swede (rutabaga?) in a little oil with a few twists of garlic and chilli flakes from a mill. I salute them for about 20 mins on a low heat with a pan lid so they sweat too. Even if he kids love them!! Thanks. Breast of chicken!! And I sauté them not salute them!! Flipping autocorrect! I just made this recipe tonight and it was SOOO delicious. This is definitely going into my rotation. Thank you for the great recipes!! Hi Ali! I know that you always leave the nutritional information about every recipe, however I do that see it on this recipe. This is seriously one of my FAVORITES, would you be able to post the nutritional facts or the weight watchers points on here? That's awesome to hear! Thank you for sharing! Made the sweet potato tonight and it was out of this world. I forgot to add the onion but I did sprinkle parsley for serving because I like to add a little color and flavor contrast to all my dishes. Seriously so good!! I want to eat the whole batch myself. Will have to try the zucchini option as my zukes are coming in from the garden. Thanks again! I made the sweet potato version this evening. My only substitution was to use some well-trimmed thick bacon because it's hard to get pancetta here. My husband declared this to be one of the best things I have ever made! Thank you. 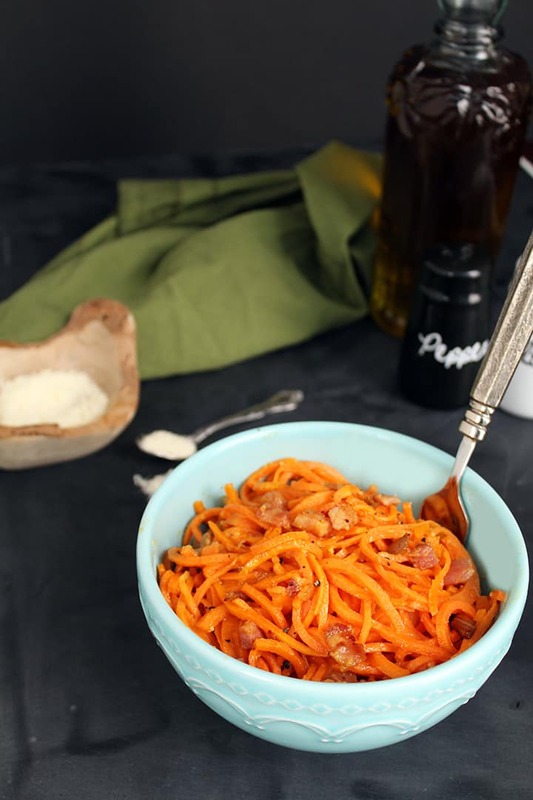 Hi Ali, I couldn't find the recipe for Sweet Potato Noodle Carbonara in the above post. Do we have to buy the cookbook to get access to it? Thanks. Oh my goodness! I had to stop eating gluten a few years ago because it was affecting my thyroid, and this dish definitely is better than the pasta version. Love it! Thanks for sharing this dish with us! Is the sweet potato recipe the same as zucchini? It appears to be missing.